Are you thinking about purchasing an antique wedding ring? Well, why wouldn't you? Antique and vintage wedding rings are unique, they're kind to the environment, they have history and character, and they're competitively priced. 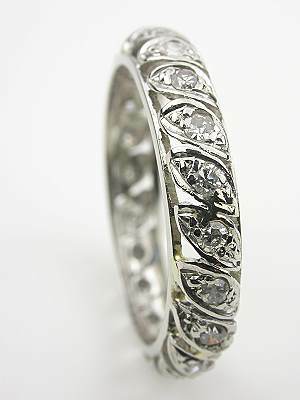 Diamond leaves dance around her finger in this hand- wrought vintage wedding ring. Oval set on the diagonal, twenty-two single cut bead set diamonds encircle the pierced antique platinum band. This vintage wedding ring has a total diamond weight of 0.44 carats. Circa 1950. Surround her finger in brilliance with this antique wedding ring. 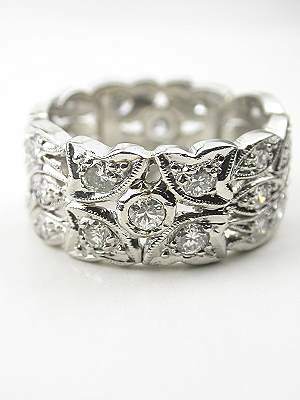 The 18k white gold band of this antique wedding ring is hand-pierced. Set with twenty-eight old style full and single cut diamonds, this wedding band shimmers with a total diamond weight of 1.45 carats. Milgrain trimming around the diamonds lends textural flavor to this antique wedding ring. Circa 1930. 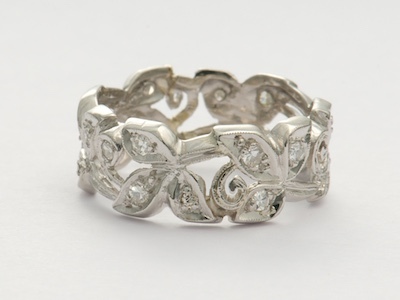 The soft flap of butterfly wings beats freedom's rhythm in1940s vintage wedding rings like this one. Scrolling end to end, you'll love the alternating diamond pattern that accentuates the double-vee configuration of this 18k white gold vintage wedding ring. The thirty-two diamonds that accent this band total 0.32 carats. Circa 1945. A bridge of gold holds two sapphires and a diamond for a three stone filigree antique wedding ring from the 1920s. 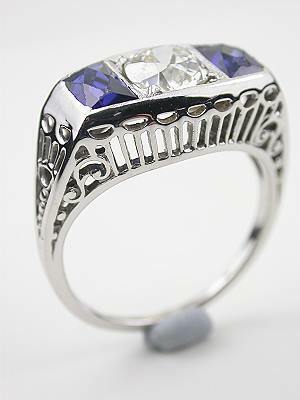 A pair of tapered cushion faceted mixed cut synthetic blue sapphires lends color to this 18k white gold antique wedding ring. Totaling 0.60 carats, the sapphires flank a centerpiece old European cut diamond. This J-colored, SI2-clarity diamond weighs 0.58 carats. Circa 1920. 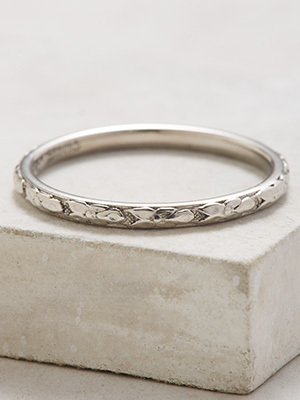 Dainty blossoms spin around this antique wedding band like flowers around a maypole. The delicate floral work on this platinum ring makes it just as beautiful worn solo as with an engagement ring. The raised orange blossom motif surrounds the band like a halo. 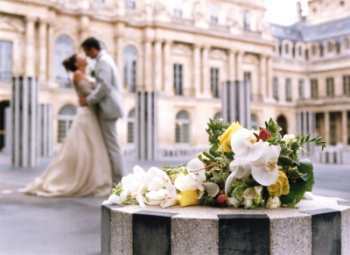 This non-stop flowery design lends itself well as the piece de resistance at a summer garden wedding. Details: Antique. Circa 1925. Iridium-Platinum. Orange Blossom & the Traub Company trademark. The two-toned metallic setting of this vintage wedding ring draws captivating attention to the hand. The white gold band is topped with a yellow gold strip that encircles its center. This top piece is carved with feathery fronds, adding visual interest and textural appeal to the ring. The band is done in a classic cigar style that sleekly hugs the finger. Details: Vintage. Circa 1970 or later. 14k white and yellow gold. ArtCarved trademark. 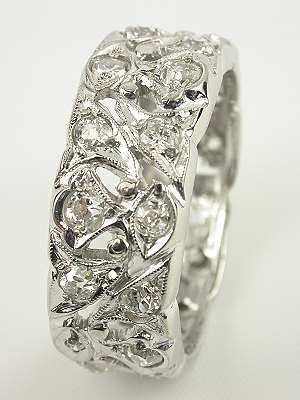 This vintage wedding ring with flowers and leaves is reminiscent of Hollywood's 1940s glamour gals. 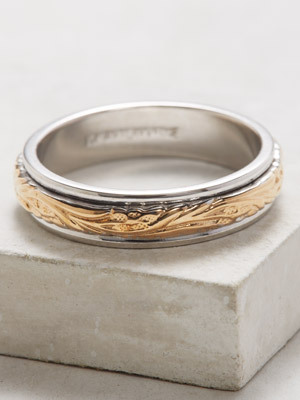 It is made of 14k white gold and combines the romantic elements of floral rose buds and velvety leaves into one attention-grabbing wedding band. The pierced floral pattern extends around the band and allows for a tiny peek of skin. The scalloped edging of this vintage wedding ring adds a feminine touch. Details: Vintage. Circa 1940s. 14k white gold. 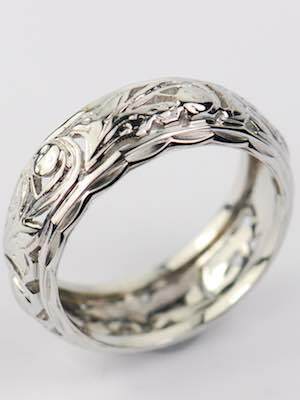 The intricate floral design on this Art Carved vintage wedding ring will please your nature loving bride. This 8mm wide vintage wedding ring features a narrow 14k white gold edge with a 14k yellow gold center. Flowers and leaves are arranged in the center piece in an elegant pattern. By Art Carved. Circa 1970s or later. 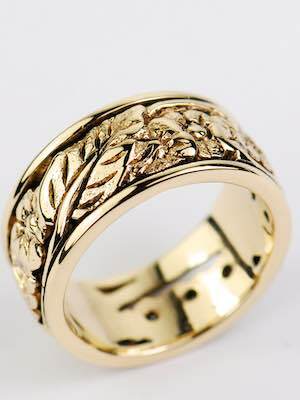 As carefree as a spring meadow, this vintage wedding ring has leafy ferns and and delicate wildflowers carved around the 9mm band. This vintage wedding ring evokes memories of the lush spring greenery in the fields along a rural country road. Made of 14k yellow gold, this wedding ring has seven full cut diamonds which form the centers of the floral display. Vintage wedding rings like this one lend a touch of understated beauty and are perfect for the nature-loving bride. Circa 1960s. 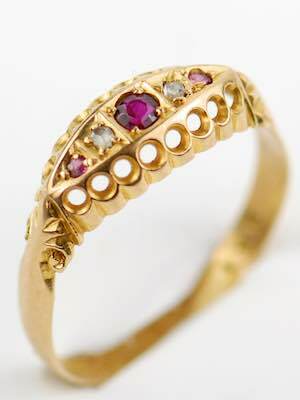 Cool diamonds alternate with fiery rubies in this Victorian-inspired vintage wedding ring. Fire and ice come together in this vintage wedding ring. Rubies and rose cut diamonds share the spotlight in the elongated East-West setting. Leafy fronds and pierced circles lend architectural interest to the gold band. A Birmingham city English hallmark adds a splash of provenance. Details: Vintage. Circa 1960 or later. 18k yellow gold. Rose cut diamonds; 0.02 carats. Round faceted mixed cut rubies; 0.14 carats. The diagonal slicing of this Art Deco antique wedding ring lends visual intrigue to the finger and showcases the band's geometric elements. The twelve rhomboids that surround this antique wedding ring's platinum filigree band are each set with a round modern full cut diamond for a total diamond weight of approximately 0.66 carats. Circa 1920s. 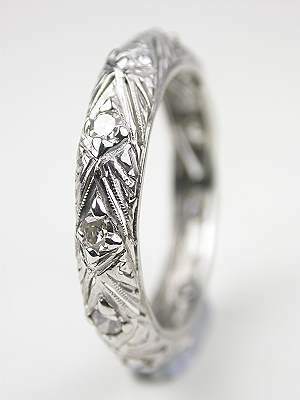 A wave of precious metal swirls and twirls around the finger in this 1945 vintage wedding ring. 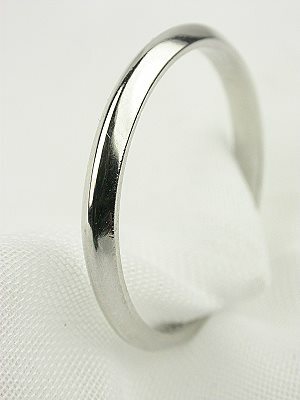 The wide band of this vintage wedding ring has polished sections on top and bottom. In between, floral cut waves rollick down the center, lending eye-catching contrast to this vintage wedding band. Details: Vintage. Circa 1945. 14k white gold. Constructed of iridium-platinum, this vintage wedding ring has a timeless design. In the early morning hours of dawn, the meadow shimmers with the radiance of dew. That same glimmer shines in this platinum knife edge vintage wedding ring. Circa 1950 or later. Diamond studded rhombuses playfully encircle this platinum and filigree vintage wedding ring to create a "hugs and kisses" or XO pattern around the band. In this hugs and kisses "XO" design wedding ring, the twelve single cut diamonds weigh 0.54 carats. 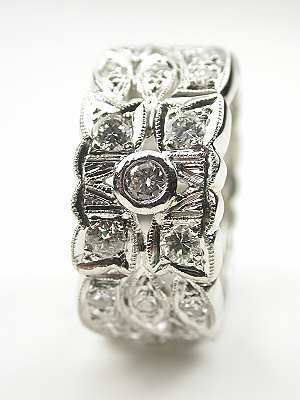 Vintage wedding rings like this one make romantic one-of-a-kind anniversary gifts. Circa 1950. 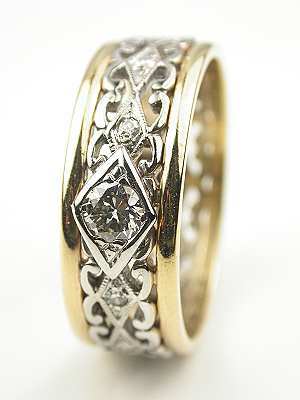 Single cut diamonds dance around your finger in this handwrought vintage wedding ring. A pierced filigree design and an engraved chevron motif add sophistication to the 14k white gold band. 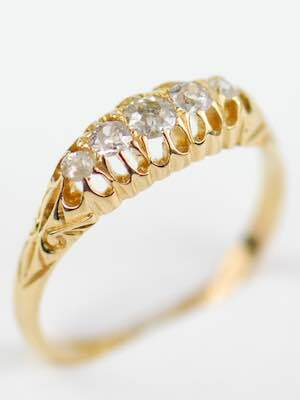 This vintage wedding ring is set with 11 diamonds which total 0.35 carats. Circa 1950. In this Retro vintage wedding ring, a pierced scroll motif in white gold is splashed with diamonds and accented by yellow gold edges. 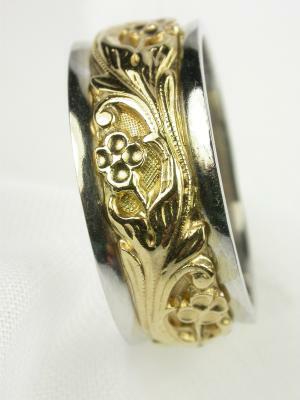 The 14k white and yellow gold band of this vintage wedding ring has the unexpected impact of open scroll work down the center. Eleven single cut diamonds accentuate the metallic intrigue. A 0.17 carat old style round full cut diamond is set in the center. The total diamond weight of this vintage wedding ring is 0.28 carats. Circa 1950. 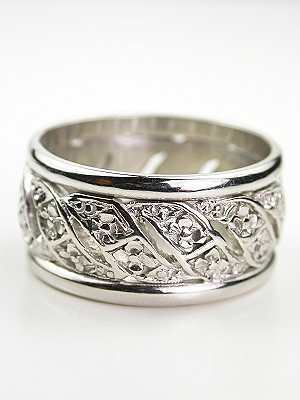 A pierced design and scalloped edges make unusual platinum and diamond vintage wedding rings like this one. Fashioned in an interlocking double-row design, this anniversary style vintage wedding ring captivates with its collection of thirty-six full and single cut diamonds. Set in platinum circles and teardrops, these diamonds total 1.44 carats. Milgrain trim separates the geometric elements of this classic eternity style vintage wedding ring. Circa 1950 or later. Leaves and ribbons wind their way around her finger in vintage rings like this one. 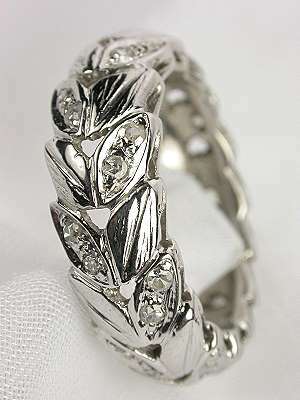 The platinum band of this vintage ring is composed of diamond accented leafy sprigs and fronds which encircle the finger like a miniature wreath. Twenty-two full cut diamonds are bead set in the band's eye-catching display, lending a total diamond weight of 1.19 carats to this anniversary ring. Circa 1950 or later. You like to stand out from the crowd. When you purchase an antique wedding ring, it's almost a guarantee that no one else will own one just like it. If you're seeking a one-of-a-kind ring without the expense of a custom-made ring, a vintage wedding ring is the perfect solution. You've opted for a simple engagement ring, or no engagement ring at all. Back in the eras from which antique wedding rings hail, many brides wore only one ring. As a result, their wedding bands took on a dual role, incorporating the sparkle of today's engagement rings with the functionality of displaying marital status. 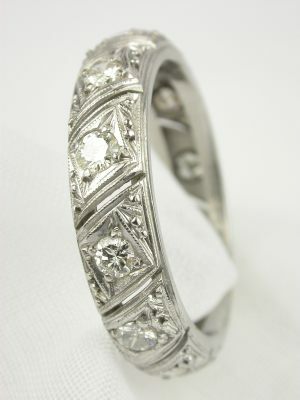 If you prefer your wedding band to do most, if not all, of the talking, then antique or vintage is the way to go. You relate to a specific historical time period. Maybe you yearn for the days of poodle skirts and bobby socks, hanging out at the soda shop. Perhaps you're a flapper at heart. No matter your personality, or which bygone era you admire, a vintage wedding ring can transport you back to that point in history that's so special to you. You want your wedding ring purchase to be an investment. Because vintage wedding rings are rare--sometimes the only remaining example of their kind--they stand a far better chance of increasing in value over time than the cookie-cutter new rings sold today. Rarity, however, isn't the only quality that lends itself to a vintage wedding ring's value. Much of the jewelry made in bygone eras is of better craftsmanship and higher quality than many contemporary options as well. You care about the environment. If you proudly wear the tree-hugger badge, every time you look at your vintage or antique wedding ring, you'll know that your choice contributed to protecting the world around you. Vintage and antique jewelry falls squarely into the "reuse and recycle" category. No additional mining or manufacturing processes went into making your wedding ring, so the earth isn't suffering any additional negative effects from it. You can wear it with a clear conscience. You're more about uniqueness and tradition than trendy flashiness. 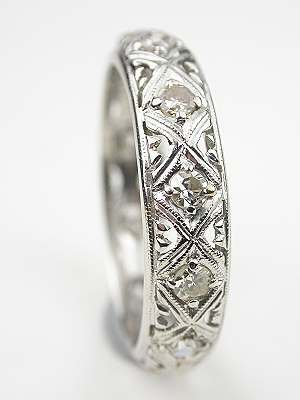 The old-style cuts of the stones found in antique wedding rings have a completely different appeal from modern-day cuts. If carat weight and clarity are your main concerns, an antique wedding ring may not be your style. However, if you prefer one-of-a-kind flair, you'll find just that in an antique wedding ring. You want your wedding ring to have a soul. An antique wedding ring has history. It has lived and breathed in the past, and the previous life it experienced has been entrusted to you. If you take that responsibility sincerely, you're an excellent candidate for a vintage wedding ring. You'll soon be walking down the aisle, and you're looking for a unique wedding ring as a symbol of your commitment. The charm and romance of yesteryear are brought to life in our elegant collection of antique and vintage wedding rings. Our wedding rings go above and beyond the traditional gold band with myriad fine details, making them truly one-of-a-kind jewelry pieces, like miniature works of art. Carved leaf engravings, floral cutwork, and open weaving are just some of the exciting features you'll find in our collection. You'll also find rings accented with sparkling diamonds, as well as vivid gemstones such as sapphires, emeralds, rubies, and more. As for precious metals, you'll be able to choose a wedding ring set in platinum, white or yellow gold, or even two-tone and tri-color gold. Browse our full collection, and find the antique or vintage wedding ring of your dreams.